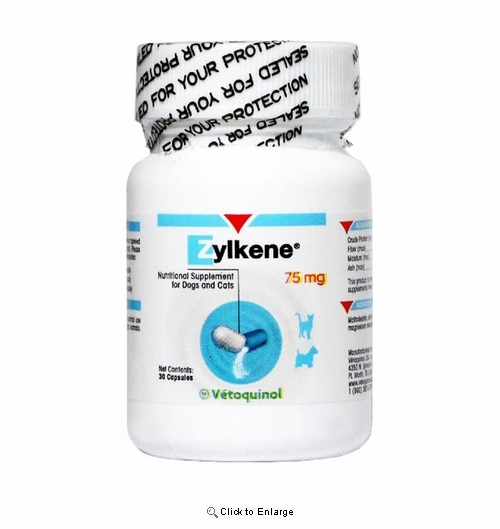 Home > Dogs > Stain/Odor/Behavior Control > Zylkene for Cats & Dogs > Zylkene 75mg 30ct. Zylkene is a feed supplement designed for cats and dogs which contains a natural product derived from casein. This ingredient helps pets cope with stressful situations or unpredicatble changes such as visits to vet, storms, trips, boarding etc. The palatable formula makes it easy to give to both cats and dogs. Give one capsule per day. Capsule can be opened and contents mixed with food or water. It can also be given as treat. For best results, Zylkene should be given a few days before needed. For example if vet visits are a problem, start administering the Zylkene a few days prior to the appointment. For long term changes such a new baby, Zylkene should be used for 1 or two months. Each bottle contains 30 caps. Please read entire label on bottle prior to use. For animal use only. Keep out of reach of children.